You’ve finally decided that it’s time to build a deck. Maybe you’re already starting to think about hosting parties out on your deck, putting in a hot tub, or just enjoying a new space in your home. In any case, you want to make sure that you build your deck the right way. As we mentioned in a previous post, this means getting the highest quality of materials. 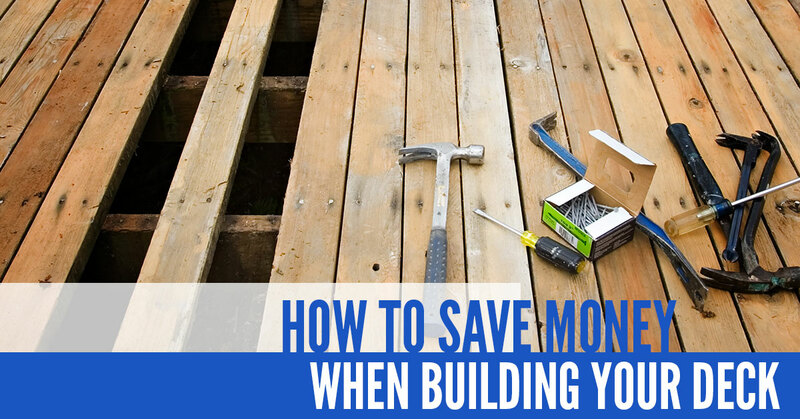 That said, there are some ways to save some green as you build your deck. In this blog post, we reveal our top five money savers. Shop around – As you would with other major purchases, it’s a good idea to shop around for deck materials. Make it a point to visit several supply outlets in your community and compare prices. Maybe you’ll find weekend or seasonal discount specials that you can take advantage of. Remember, though, that quality trumps everything when it comes to decking materials. Use standard dimensions of lumber – It’s usually more expensive when a homeowner chooses odd lumber sizes as opposed to standard dimensions. For example, have the deck extend out from the house 12 feet as opposed to 11 or 13 feet. Believe it or not, this can save you quite a bit of money. Work with someone else who is also building a deck – There’s a good chance that one of your friends, relatives, or coworkers are building a deck of their own as well. Try to work together to collectively obtain the best possible deal from supply outlets. These stores may give the two of you a discount since you’re purchasing more lumber. Plus, teaming with someone you trust potentially saves the both of you time in the building process. Rent equipment rather than purchase it – There’s some equipment required for building a deck that you may never use again. With that in mind, head to your nearest home improvement center when you get the chance. They should have a wide range of tools and equipment available for rental at a reasonable cost. Apply a protective finish to your deck – Once you’ve finished building your deck, the job is done, right? If you want your deck to last, there is one more thing to do. By applying a protective finish to your completed deck, you’re protecting a new investment. A deck that isn’t protected is susceptible to expensive deck repairs and additional maintenance. At Ready Decks, we strive to provide the highest quality site-built decks in the shortest time possible while offering homeowners the greatest value. Our team is proud to make beautiful, affordable decks a reality for so many folks nationwide. By combining our high-quality materials with an innovative, patent-pending building system, we offer homeowners a tremendous value for their investment. The best value our deck installer offers, though, is longevity. As opposed to products from other decking companies, our decks look better and last longer than others on the market. An experienced deck contractor ensures that you and your family will enjoy the deck for years to come. So if you’re looking for value when building your deck, get in touch with our local deck builders.